Before we get to the actual recipe, we need to talk about the WTF moment I had this morning while stuck OUTSIDE on my 3rd floor balcony in nothing but a sports bra. * Apparently faulty screen door hinges are a thing and can lock you out of your apartment (and keep you locked out until your neighbors hear you yelling and the property manager saves the day — which fortunately, was quite quick). It was basically enough time to construct a Spider man-esque escape route (thankfully not necessary), rearrange the patio furniture, get 45 minutes of California sun, and think about what to do with the 20-something pound watermelon sitting on my kitchen counter, which, to no surprise, was make juice. Not just any juice, the perfect summer of self-love drink. Equally hydrating and insanely delicious, this cooling summer blend has been on my mind since my bff's annual “pink drink” pic appeared on my Instagram feed 6 weeks ago. While it’s not your traditional pink drink (I’m not actually even sure what’s in a traditional pink drink? ), and definitely won’t be found at Starbucks, it’s ridiculously good and beyond easy to make. 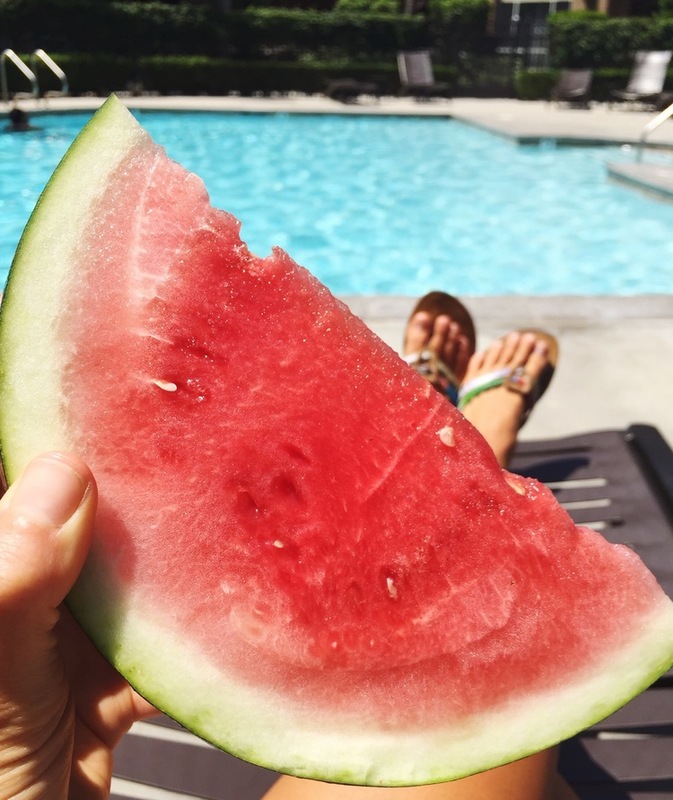 Watermelon is loaded with lycopene (helps maintain eye health) as well as potassium (neutralizes acidity in the bloodstream), vitamin C (strengthens immunity), vitamin A (supports healthy vision, skin & glands) and vitamin B1 (helps convert protein to energy). Not only that, watermelon is one of the top cooling foods on earth making it perfect for hot summer days like today, which back in Boston, is pushing 98 degrees. Pro-tip: To pick a ripe watermelon, knock on it - a hollow sound means it's ready. Powerful skin rejuvenators, limes are notoriously high in vitamin C (immune support) and flavonoids (antioxidant and anti-inflammatory properties). Despite their acidic nature, like lemons, limes actually promote alkalinity in the body and stimulate natural detoxification. Mint helps alleviate gas, aids in digestion, is rich in antioxidants, and has been shown to have significant antibacterial, fungicidal and insecticidal properties making it useful against many common bacterial pathogens and candida. Plus, it’s really good in this recipe and currently growing like wildfire in our garden. Thoroughly wash produce and throw it in a juicer. (See notes below for blender method.) Drink up. Use frozen watermelon, make this recipe in a blender, keep the pulp, and turn this into a slushy. We use a citrus squeezer to juice the lime. Store your watermelon in the fridge before use. It’s best to keep the ingredients (mainly the watermelon) cold, as cold produce yields more juice than room temperature produce. PS. If you make this recipe, we want to see! Tag us on Instagram at @thedailyalchemy so we can heart your pic? What’s your favorite summertime refresher? Share below in the comments. THIS POST ORIGINALLY APPEARED ON URBAN ALCHEMY. June 20th, marked the first *official* day of summer and the start to a whole new slew of beach trips, 3-day weekends, short shorts, and island inspired acai bowls. To honor summer solstice, the fiery heat of our favorite season and our love for the months that follow, we’ve rounded up a few of the items we’ll be eating, drinking, doing, reading, wearing, and otherwise enjoying so that you can enjoy them too. 1. Plenty of green juices and green smoothies because #health. 2. SPF! A high quality preferably organic and non-toxic sunscreen that you can wear everyday is a MUST. We like this kind by Badger. Hint: Add a few drops of coconut or argan oil to your sunscreen to help spread it out. This dilutes it a bit but without the oil it goes on kind of patchy. 3. 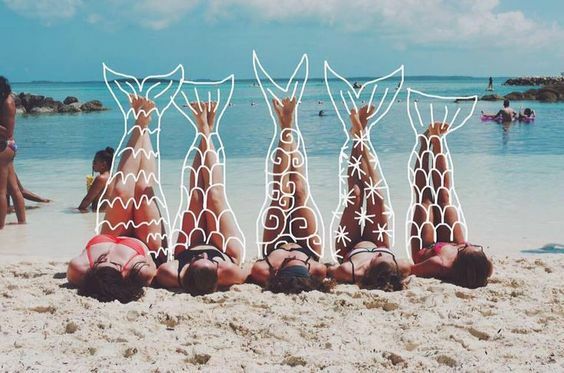 A long-weekend getaway with your girl-gang to destination Korakia or your local bohemian hideaway. 4. A stack of captivating beach reads. 6. A fantastic pair of sunglasses. To keep our peepers safe from harmful UV rays we’ll be sporting these, these, or a combination like these. 7. Hydration is key (especially in the summer). Let this water bottle serve as a fashionable and functional reminder to up your h2o intake. 8. Confidence; also key. Because nothing (including her seemingly perfect hair, ridiculous “beach bod”, and insanely amazing summer wardrobe), should inhibit you from seeing, owning, and rocking YOUR own perfection. 9. This. It only seems non-essential until it’s mid-July and you’re nearing the end of a Saturday afternoon sweatfest aka yoga class. 10. Classic denim shorts. We live in these from June - August. 11. An extremely skimpy bikini like this one to show off that steamy summer bod. 12. An eco-chic summer satchel to carry all your farm fresh produce. 13. A big a$$ towel because lying poolside and 9-5 beach days are of utmost importance. 14. An epic summer soundtrack for those aforementioned beach days. May we recommend the classic A) Lemonade and B) more Beyonce. 15. Coconut oil (obviously). A year-round essential for silky smooth skin and virtually everything else. 16. Also on that note, coconut water. Preferably straight from a coconut. 17. For all the amazing summer cookouts you’ll be attending you’re going to need a killer guacamole recipe. This one is ridiculously good. 18. A good waterproof mascara so you come back from the beach looking like a bronzed goddess not a racoon. 19. 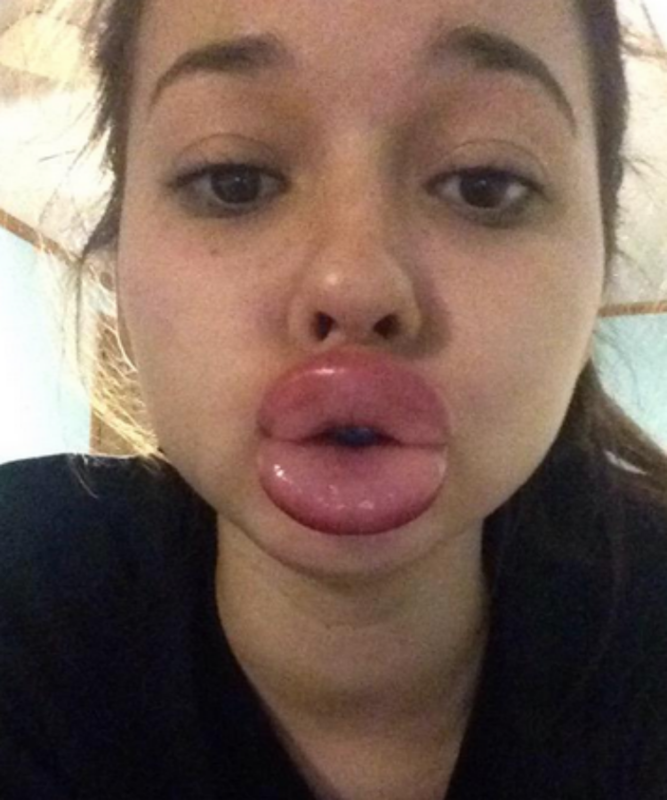 Chapstick with SPF so you can avoid incidences like this. 20. Rosewater mist for a hydrating mid-day summer refresh. 21. Cute and comfortable sneakers like these because as wonderful as it would be to spend your entire summer laying beachside with a popsicle in one hand and your iPhone in the other, enjoying nature (phone-free), is one of the easiest ways to make your summer unforgettable. Grab your favorite people and get exploring. What are your must-have summertime essentials? Leave your top three in the comment section below. And if you liked our list, spread the love! Forward this post to two of your friends and share it on social media. Self-care — the not always easy practice of taking care of oneself — is absolutely, fundamentally, without a doubt integral to this whole self-love thing. We’re so conditioned to give love to those around us, give time to our work, passions and callings, give ourselves up to those who need us, that we often forget to take care of ourselves, first. I might as well be the poster-girl for this sentiment. I am constantly getting caught up in the go-go-go economy of our society. Like, as a freelance writer and entrepreneur, I’ve convinced myself that I don’t deserve sleep and the only way I’m going to be a success in this world is if I work 27 hours a day. I’m also a binge writer, which means when I’m in flow, please don’t talk to me or try to feed me or pull my weary fingers from my keyboard. I’m busy. On top of all that, the best way I know how to show my love to others — my boyfriend, my family, my friends — is to give to them. So, because I want my tribe to know how much I care about them all the freaking time, I try to give constantly: my services, my money, my ears, my heart, my laughter, my love. Add it all up, mix it around, give it a week, or month, two if i’m lucky, and I end up burnt out, deflated, exhausted — mentally, emotionally, physically depleted. I’m learning, though. Because that version of me is no good for anyone. Spoiler Alert: You can’t pour from an empty cup. Self-care enables you to give more (of your best self) to those you love. Over the last couple of years, I’ve proactively prioritized a handful of self-care rituals into my every day. I discovered yoga (yes, I know how cliche that sounds), and discovered I’m a better human after I’ve practiced. Both my BF and I have agreed that I’m definitely a better girlfriend after I’ve had my morning bulletproof coffee. And everyone who loves me knows that If I’m acting a bit on edge, it’s because I haven’t written anything lately. For me, writing — creating — is self-care in it’s most divine form. It’s not always easy. I skip a yoga class every now and then, miss my morning coffee, and get too busy with my work work to write anything for myself. But self-love isn’t always easy. It is, however, really f&*king worth the effort. SO. Avoid the inevitable burnout by taking care of number one, first (that’s you). What do you need to do to feel the way you want to feel, every single day? This can seem like a daunting question at first, but knowing the answer allows you to plan for (self)love. Not Sure Where To Start. I’ve got some ideas. 24 of them to be exact. Get more sleep. If, like me, you struggle with sleep try listening to a sleep meditation in bed. Eat food that makes you feel good. Exercise — not the painful kind you dread. Find a form of exercise you and your body love. And do it often. Engage in deep and meaningful conversations with the people you love. This is pure soul food. Write in a journal. If this is a new practice for you, let Katie Dalebout’s book, LET IT OUT: A Journey Through Journaling be your guide. If you are even remotely close to a body of water, by all means, go to the beach. Meditate. Or at least try to. Soak up alone time. It is precious, valuable, and absolutely vital to your wellbeing. Stop glorifying busy, and rest. I mean it. Watch the sunrise. It’s medicine. Watch the sunset. It’s also medicine. De-clutter your space. Not just your physical space, but your heart space, head space, soul space. Need motivation? Read this. Write yourself a love note. Splurge on a feel-good outfit. Every girl needs at least one reliable feel-good outfit in her closet at all times. Find something to celebrate. Every. Single. Day. THIS POST ORIGINALLY APPEARED ON LITTLEFOOLBOOK. Due to crazy high temps and ridiculously humid days happening here in Boston, we’re currently avoiding all recipes that actually require effort and politely declining all social situations that don’t involve ice cream, acai, or these insanely refreshing coconut water coolers. But before we get to the recipes, a quick word on coconut water, hydration, and per reader request, how to stay cool when it’s hot AF. We’ve discussed it multiple times but so many of us still seem to forget this simple health hack. Proper hydration, as in, at least 3 liters of water per day (more if you’re active or live in a hot climate), is one of the best things you can do for your health. However, in order to reap the benefits of water, which includes clear skin, healthy digestion, properly functioning organs and a longer lifespan, you actually have to drink it—lots of it. While coconut water is certainly not a substitute for actual water (the mother of all hydrating drinks), it is in fact one of the most naturally hydrating and nutritious drinks on the planet. In addition to being comprised of about 95% water, it’s loaded with vitamins (especially C and B-complex), minerals (mainly potassium, magnesium & copper), bioactive enzymes that aid in digestion and metabolism, cytokinins (minimize the aging of skin cells), phytohormones, antioxidants, amino acids and electrolytes making it popular among athletes and an excellent alternative to traditional sugar-sweetened sports drinks like Gatorade. Raw coconut water—preferably straight from a young coconut—is always ideal, but Harmless Harvest coconut water (found at Costco, Wholefoods, and other natural food stores), is also a great option. We highly recommend reading this article by Food Babe, Vani Hari, on how various brands stack up as NOT all coconut waters are the same. Unfortunately, a lot of what you find on the shelves is heavily processed reconstituted coconut water concentrate void of nutrients made by reducing fresh coconut water to a syrup and tastes absolutely nothing like the real thing. Coconut water is an acquired taste, but this slightly sweet, almost nutty, tropical bev has won us over. Perfect pre or post-workout, and anytime during the summer, this is THE drink to keep you cool when it’s hot AF. Combine 12-16 oz fresh coconut water with a handful of fresh mint leaves. Mix 1/2 oz of rose water with 8-12 oz fresh coconut water. *Make sure your rose water is food grade (i.e. safe to ingest). Combine 16 oz fresh coconut water with the juice of half a lime and 1 teaspoon manuka honey. *We like to dissolve the honey in a bit of hot water before adding in the other ingredients. A light splash of tequila transforms any of one these into an insanely delicious coconut water cocktail. Opening the coconut is definitely the most difficult part about this recipe. We use a Coco Jack, you can also use a sharp knife but please be careful. Reserve the fresh coconut meat for smoothies and desserts. What’s your favorite summer drink? Share in the comments below. These coconut water coolers are currently on tap in our kitchens. I’ve been really tired lately. Like, struggling to get out of bed tired, guzzling 6 cups of coffee a day tired, falling asleep mid-Mindy Project tired. And every time I catch a good glimpse of myself in the mirror I can see the tired all over my face: The bloodshot eyes, the dark circles, the dehydration lines, and an overall lack of radiance (maybe that’s just another warm welcome from adulthood?). Some days, I’m pretty sure I could pass for an extra on The Walking Dead. This would all be very depressing, and likely end with me crying gigantic crocodile tears (that would only dehydrate me more) into my coffee, except there’s a twist. I don’t mean to brag, or anything, but I’ve been receiving an abundance of compliments on my skin lately. Apparently, despite what I see in the mirror (zombie vampire, aka dead), my skin is glowing! It’s radiant! I totally don’t need botox (yet)! And I know what you might be thinking—I’ve got some great friends, right? And yes, you’re totally right—they’re GREAT—, but only like, 33% of these generous compliments have come from my friends’ lips. The rest (you do the math) have been from acquaintances, strangers, and estheticians who have, quite literally, nothing to gain from their compliment. I can tell you that it’s definitely not the lack of sleep or the stress and anxiety that comes from being your own boss and making sure the lights stay on. It’s most certainly not from staring at a computer screen for 12 hours a day. And I can 100% guarantee you, it’s not from the 8000 bottles of wine I’ve dared to drink anytime the girls get together for a GNO (Girls Night Out) that never actually makes it to the O-part because we’re all too drunk and tired to remove the wine stains from our lips and call a cab. No, it’s not that, at all. All that I can attribute to the state of my apparently good skin is 1) genetics (thanks, ma and pa!) and 2) my—oh gawd, I can’t believe I’m going to say it—beauty regime. So, in case you, too, are feeling like the run-down is showing all over your face, or you own a t-shirt that says “my under-eye bags are designer," I’m going to spill all my glowy skin, I-swear-I-get-enough-sleep, and stress? What stress? beauty secrets. I’ve been using Thayers Witch Hazel Toner for years. Apparently, it’s a natural remedy that’s been around since 1847, so if you were wondering how all the ladies in those old b&w photos had such flawless smooth skin, I’d attribute it to Thayers (and not the fact that black and white camera’s from the 1800’s were likely fairly forgiving). I always buy the Aloe Vera formula with Rose Petal, because it just sounds a whole lot more luxurious than the original unscented version. Plus, rose water is meant to be calming (and it smells really good). The best part about this all-natural blend—the witchcraft part—is that it’s not just a toner, it’s a cleanser, too. So if you’re like me, and pretty lazy about your beauty regime, this is literally the perfect product. I use it morning and night, religiously. After my cleansing and toning, I add more rose. This time in the form of a moisturizing oil. Badger’s Damascus Rose Face Oil is everything: USDA Organic, Gluten Free, Cruelty-Free, and smells f&*king fantastic (if you’re into roses, that is). It’s also super moisturizing and designed for delicate skin. My boyfriend, who loves to give me a hard time for buying stuff like this, has officially worked this facial oil into his daily routine, too. It's that good. We go through a bottle of this stuff at least every two months. After I’ve given my rose oil a few minutes to sink in, I add a layer of Andalou Naturals All-in-One Brightening Beauty Balm with SPF 30, because I’d rather have my face be wrinkle-free than tan (and that’s why bronzer exists, duh). I usually apply a dime-sized dollop to my face and neck. Its soft sheer tint adds a touch of color without making it look like you’re wearing layers of foundation, which is precisely the balance I like to strike. Basically bare-faced. Most days, I leave it at that. But, if I’m going to be outdoors, or in public, and I want to give off that gorgeously nonchalant “I woke up like this,” look, I’ll enter into phase two of my beauty regime. When it comes to beauty products—or any products I use, for that matter—I try to go green, natural, and organic. I haven’t always been this way. In case you don’t remember, I used to casually drop hundreds of dollars at Sephora on products promising me things like 12 hours of shimmer, kissable lips, and impossible-to-see pores. Then, one day, I looked at the ingredients list in all the products I was using and realized that instead of making me look younger and healthier, these products were probably long-term aging me. I’ve been experimenting with clean beauty products for a few years now, and it’s been underwhelming, to say the least. The lipsticks don’t stick as long, the black-ink mascara irritated my eyes, and the powders were too chalky. And then I found Josie Maran. WAIT, before you say it, I know her products don’t pass every green test. But they’re cleaner than most and help me achieve the exact glowy look I’m always trying for. So I’m willing to overlook some things. I use the Protect + Perfect Argan Daily Moisturizer with SPF 47 combined—literally—with the Argan Enlightenment Illuminizer. Nothing fancy over here. I simply mix a dollop of each in my hand and apply to my face and neck and voila — glowy and enlightened! The final step in my beauty regime—and the third-party to my triple-threat—is not natural at all. But I love it. I use Benefit’s Watts Up! Cream-to-powder highlighter wand to give a champagne glow around my eyes and on my cheekbones. Because I think I read somewhere that contouring is out and highlighting is in and Gigi Hadid always looks perfectly highlighted. So, there's that. And….That’s it! From zombie to presentable in under three minutes. Marie Kondo, the Japanese organization expert, decluttering consultant, and international phenom made famous by her revolutionary approach to tidying is absolutely slaying the war on clutter. Her mega-bestselling books, including The Life-Changing Magic of Tidying Up: The Japanese Art of Decluttering and Organizing and its follow-up, Spark Joy: An Illustrated Master Class on the Art of Organizing and Tidying Up have sold more than seven million copies worldwide. We’ve already begun applying the KonMari method to our closets with extraordinary results, which got us thinking, what else can we KonMari? Albeit an obvious next choice considering cooking is kind of our thing [link], Kondo already has this one covered in depth. Her goal with the signature Kondo kitchen cleanse is to help you create a space that you actually enjoy cooking in. Kondo encourages to take advantage of vertical storage space and to add pops of color (like flowers or plants) that make you happy. But above all else, she advises to keep it clean! That means nothing on the countertops, in the sink, or on the stove. A huge challenge for most home cooks but according to Kondo: outer order = inner calm. A truth we firmly stand behind. We’ve been decluttering our days since Vancouver's own goddess of truth, Danielle LaPorte, began waxing poetic on the subj. The point (to clearing your calendar and saying no) is that it frees you up to say yes to what you really want to do (vs. what others want you to do or what you *think* others want you to do). And assuming you’re not filling your schedule back up with busywork activities that need to be written down and accounted for, Kondoing your calendar creates the freeing, healthy, good-for-the-soul kind of whitespace. Something we could all use a little more of. To Kondo your cal, take a look at your current commitments. Is there anything you need to politely decline, reassign, delegate, designate, pull back from, reshuffle, or *gasp* cancel? Be ruthless (in the kindest way possible). New commitments? Filter everything through Kondo’s signature question: "Does this spark joy?" Only say yes to things that do. Speaking from experience, the inner liberation that comes from a (mostly) clear calendar is life-changing. It only makes sense to use products you love, especially on the face you’re putting out into the world! Whether it’s a smokey eye and bold lip or a simple moisturizer and SPF, if you enjoy your beauty routine, that joyful energy will radiate out into the world. In true KonMari fashion, use products you love and adore. Get rid of the rest. Our inner Kondo’s kind of freaked when we took a closer look at our email inboxes (all 9 of them). Despite enrolling in Unenroll.me back in December, there is still a lot of stuff sitting in my inbox I literally never open, never mind read, or even remember subscribing to. As Kondo would say, “thank you for __ [insert your reason of choice here],” now UNSUBSCRIBE. Clutter can be more than just the physical stuff so it’s important to take inventory of your entire space, including your psyche. We have between 50,000-70,000 thoughts per day, all of which are creating your reality. How many of these thoughts are currently bringing you joy? If you’re human (or anything at all like us), according to Google, it’s probably around 20-ish percent? Time to Kondo that. Although Kondoing your heartspace (i.e. your relationships) usually requires uncomfortable “inner work”, forces you to get vulnerable, and on many occasions, involves very difficult conversations, the freedom, and clarity you gain from letting go of toxic relationships is incomparable. As Kondo might suggest if the relationship isn’t serving you, it’s probably time to part ways, bid gratitude, and let it go. Kondoing your dinner plate involves asking yourself prior to eating, does this food spark joy, real joy, or am I eating out of starvation, boredom, guilt, or some other form of mind hunger? Which again like the above, only you can answer. What areas of your life would benefit from a little KonMari? Continue the conversation in the comments. This space is yours. Though we’ve been unofficially celebrating since idk, April? Today, the day after Memorial Day, marks the first official unofficial day of summer and the start to a whole new slew of beach trips, 3-day weekends, bikinis and short shorts (if that’s your thing). Our thing, as you know, is self-love, self-care, selfies (obviously), and today that means nourishing ourselves with island inspired acai bowls. Acai (pronounced “ah-sigh-EE” — I called it “uh-kai” for years until I worked behind the bar at a cold-pressed juice and smoothie co.), is a total powerhouse. Loaded with a vast array of nutrient dense vitamins, minerals, essential fatty acids, antioxidant polyphenols and flavonoids, acai is one of the most nutritious foods on the planet. These power packed, small, dark purple gems grow throughout the tropical regions of Central and South America and taste somewhere between rich chocolate and ripe berries making acai the perfect flavor combo for smoothie bowls (and for pretending you’re on the beach in Hawaii). Self-love in it’s most delicious (and nutritious) form. Combine all acai bowl ingredients into a high powered blender and process until smooth and creamy. You might have to use a tamper to pack it down. (This bowl is thick.) When done, scoop mixture into a bowl and top with desired toppings. We love fresh fruit, shredded coconut, homemade granola, and a drizzle of raw local honey. Delish. -Although we haven’t tried it, this recipe might work using a food processor. If you try this method be sure to stop occasionally to scrape down the sides. -We love extra crunch so before scooping the acai smoothie base straight into your bowl, add a small amount of crunch (granola, cacao nibs, etc. ), to the bottom of your dish; then add your smoothie. -To make this recipe vegan, sub 1-2 medjool dates or equal amounts of raw coconut nectar for the honey listed above. We want to see your creations! 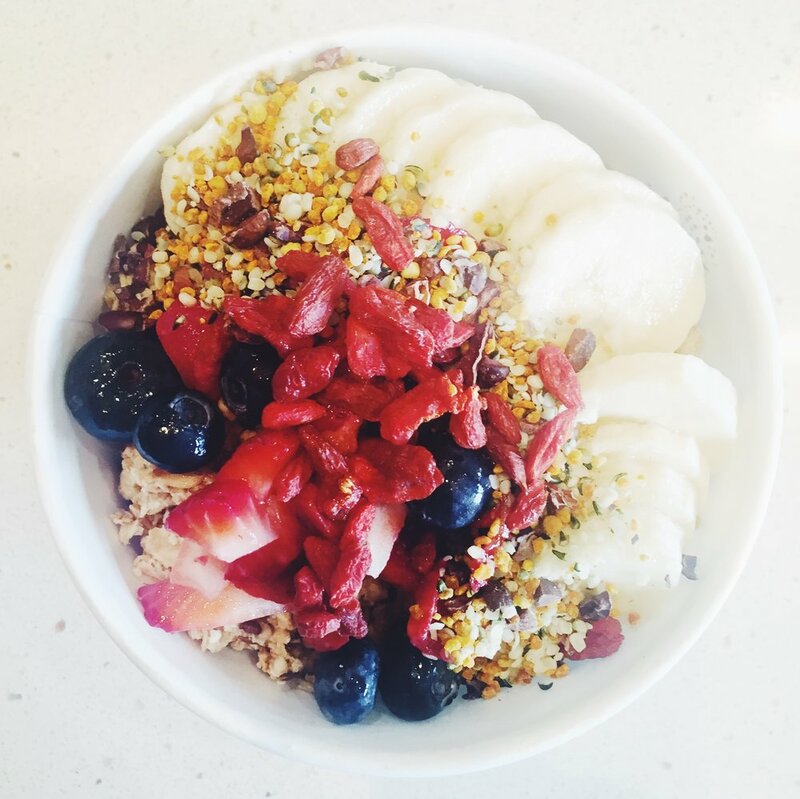 Take a pic of your acai bowl and tag us on Instagram at @lovebombbootcamp using the hashtag: #lovebombbootcamp, so we can like your photo. *Bonus points for selfies. Want more self-love inspired recipes? Leave a comment and us know! After all, this space is for YOU. Proactive self-care: The ongoing practice of taking care of yourself, your WHOLE self, mind, body and soul, every day. It’s the decision (self-responsibility) that we make to nourish, recharge, and care for ourselves often in lieu of pushing through, striving for, and “doing more”. It’s giving ourselves permission to pause and replenish regularly (not just when we need to), without judgement, critique or criticism. Proactive self-care can be as simple as eating lunch away from your desk, going to bed by 10pm, asking for help with the dishes, or as lavish as a phone-free meditation retreat in New Zealand. For me personally (this is different for everyone), proactive self-care is being radically honest with myself about what is and isn’t working, establishing clear and healthy boundaries, and mindfully adhering to my daily “non-negotiables”. In other words, it’s actually doing the things that help me feel my best like nourishing my body with nutrient dense foods, practicing yoga to keep me sane, and spending time away from work (regardless of my ever expanding “to-do” list), daily. *Because this is apt to change. Proactive self-care looks like waking up before the rest of the world to spend time with myself, alone. It’s reading good books, indulging in creative pursuits and not checking email every single day. It’s focusing on one thing at a time, getting outside in nature (regardless of the forecast), and surrounding myself with inspiring people that make me a better human being. Proactive self-care means doing yoga or some other type of physical activity, daily. It means tuning in, actively paying attention and listening to my body for exactly what it needs. It’s sleep, at least 8 hours, it’s real food, lots of greens, currently it’s no sugar (with the exception of figs and dairy-free ice cream), and it’s lathering my skin (and hair) in coconut oil even when I’m feeling “lazy”. Proactive self-care is saying thank you, often (including the moment I wake up). It’s the beach, it’s meditation, it’s regular chats with this beauty, it’s mandatory tech-free time, and sometimes (depending on the season), it’s a totally mindless t.v. show. It’s also endlessly searching for the miraculous within the mundane, compassion, flexibility and although it’s never perfect, it’s giving myself the freedom and space to not work when I think I “should be”. What does self-care currently look like for you? Is it proactive or reactive? We’d love to hear your thoughts in the comments below. Share your practices, your rituals, your struggles, and how you feel when you actually tend to you. THIS SITE WAS Built by girls.